The Hobbit franchise reaches its conclusion in this epic battle finale that concerns all the good and bad of Middle Earth. Men, Dwarves, Elves, Orcs and Wargs and the Eagles all come together to fight in this huge battle in front of the Lonely Mountain which contains an almighty treasure. I first read The Hobbit around 10 years ago and I have reread it a couple of times since, and I must say that I prefer it to The Lord of the Rings books, it is one of my favourite books and I have on the whole enjoyed the portrayal of Tolkien’s brilliant book into 3 fairly entertaining films, though they have their flaws. Most notably is the length of the trilogy in comparison to the actual book. But before I get to the flaws, I have to commend the excellent core cast; especially Freeman, Armitage and Cumberbatch. They were the perfect Bilbo, Thorin and Smaug. Freeman has been a great Bilbo, with his subtle and gentle nature refreshing in a film dominated by war, savagery and death. However, he is very much sidelined in this instalment due to the focusing on characters such as; Thorin, Bard, Thranduil, Legolas and Tauriel. This is very much a Jackson film rather than a Tolkien tale due to the inclusion of Legolas and Tauriel, who don’t feature in the book. They become characters more focused on than Bilbo it seemed. Perhaps it was to fill the time, satisfy the audience or to add something else to the film. Thorin, the brave, strong and flawed dwarf King who led the dwarfs to reclaim their homeland, however, he is consumed by greed and his lusting after the Arkenstone. Armitage’s portrayal was absolutely spot, his depiction of Thorin’s need and greed over the treasure was brilliant and he again was great when it came to Thorin’s moral turnabout, his fight with Azog and his reconciliation with Bilbo. Smaug, though he only features at the beginning of this film, leaves a lasting impression. Cumberbatch’s voice and the terrific CGI bring to life the powerful, destructible and terrifying dragon. The fighting, CGI and acting are the highlights of the BotFA, and there is no denying that the film has some entertaining, brilliant and touching moments. Obviously, the ending stirs some feelings among the ardent fans of Middle Earth and the Hobbit franchise because it brings an end to the 16 year association with Tolkien’s world. Bilbo’s goodbye, Thorin’s death and Billy Boyd’s song in the credits encapsulates that. The fight scene between Thorin and Azog was scintillating stuff and the monumental fight scenes between the 5 armies were blockbuster-esque material and straight from the Peter Jackson textbook. 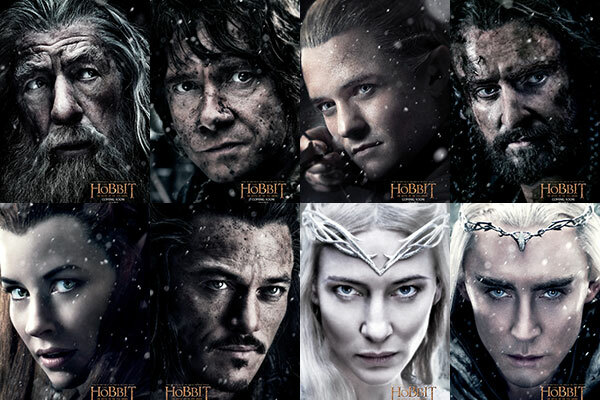 However, I do have some issues with the film and the trilogy as a whole, firstly was the fact that The Hobbit is a normal sized book which has been elaborated into an 8½ hour epic saga, which on the whole is pretty decent, but for large parts of the trilogy, not much happens that is crucial to the central storyline. In comparison to The Lord of the Rings, a 9 hour depiction of 3 books, a lot more happens that is important to the various different strands of storyline which are all crucial. For many people, they will inevitably compare the two trilogies concerning the Middle Earth stories and I have a feeling not many will say they preferred The Hobbit. Also, there was a moment at the end of the film when Thranduil tells Legolas, as he is about to go off on his journeys that he should look for Arathorn who is going by the name as Strider, who is a promising Ranger in the North. Immediately I thought he wouldn’t have been old enough at the time of the battle, therefore, after a bit of digging I found out that Arathorn would have been 10 at the time of Battle of the Five Armies! I wouldn’t have thought he would have been a seasoned Ranger at that age … or was Jackson just trying to tie The Hobbit and The Lord of the Rings too closely together? That brings me to the point that I disliked most about the films, Jackson’s attempt to portray The Hobbit as a prequel to The Lord of the Rings, rather than a standalone 1 or 2-film story. This entry was posted in Films and tagged Benedict Cumberbatch, Bilbo, Gandalf, Lord of the Rings, Martin Freeman, Middle Earth, Peter Jackson, Richard Armitage, Smaug, The Battle of the Five Armies, The Hobbit, Thorin. Bookmark the permalink. Nor have I but I’ve heard that it is. I haven’t seen the final movie yet. I usually wait until the cinemas are a lot emptier. But I fail to see how a children’s book needs 3 movies. More detail could have been added to LOTR and less by far to the Hobbit. As much as I love the character of Legolas, I don’t feel characters should be added to the movies when they aren’t in the books. I have to say though, I have been wanting to see the battle of 5 armies on the big screen since before Jackson started this trilogy.